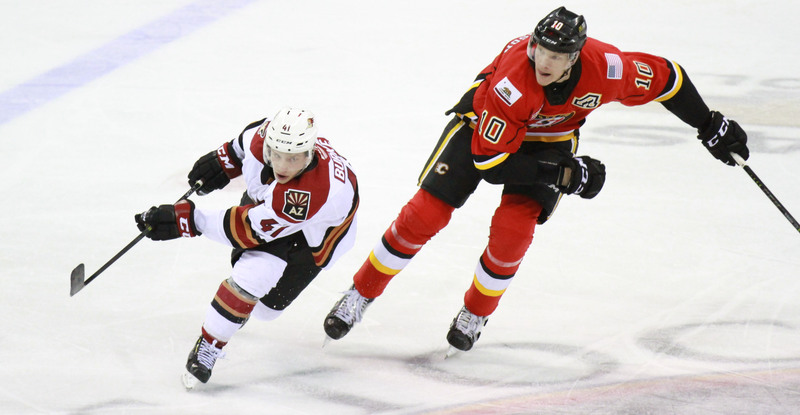 The Roadrunners earned themselves a much-needed boost on Friday night, topping the Stockton Heat by a 3-1 count at Stockton Arena. The win snapped the team’s franchise-long seven-game losing streak (0-6-1-0), including a run of three consecutive defeats on the road. Tucson’s offense combined to score three goals for the first time in seven games, and for just the third time in its past 17. Tucson improved to 4-3-0-0 on the year against Stockton, with the eighth and final regular season meeting between the teams slated to take place Saturday night. Adin Hill, playing in his 100th game in a Roadrunners uniform, put forth yet another solid performance, stopping 25 of the 26 shots he faced – holding Stockton’s top-ranked offense to just one goal. Just past the midway mark of the first period, Robbie Russo connected with a slap shot after intercepting a Stockton clearing attempt, beating Jon Gillies with a laser low to the blocker side. Michael Chaput, credited with the secondary assist, registered his first point in a Roadrunners uniform. 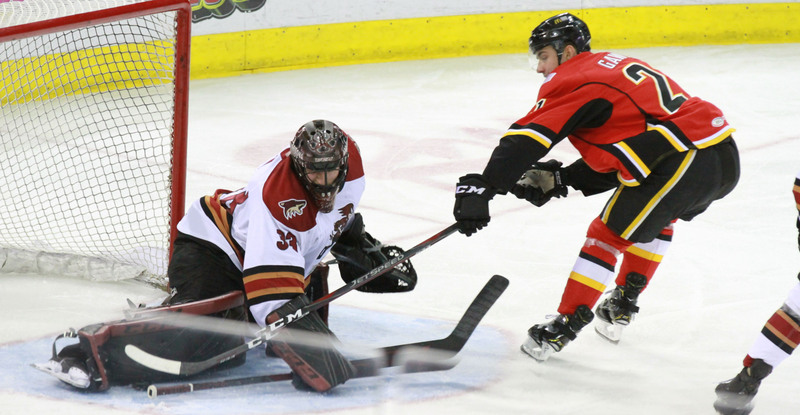 The Heat struck to tie the game 1-1 five minutes into the second period. With less than five minutes remaining in the middle frame, Lane Pederson, after winning an offensive zone draw, established positioning in front of Stockton’s net and redirected a Jalen Smereck shot into the net, giving the Roadrunners a 2-1 lead. For Pederson, it was his team-leading 15th goal of the season. Smereck’s primary assist was his third-career AHL point and his first since April 15, 2017, when he registered a goal and an assist against the Heat in the very same building. Michael Bunting padded the Roadrunners’ lead with 41 seconds left on the clock, tipping home an empty net tally. The teams will meet for a rematch on Saturday night at Stockton Arena, where the puck is scheduled to drop just after 6:00 PM PST.